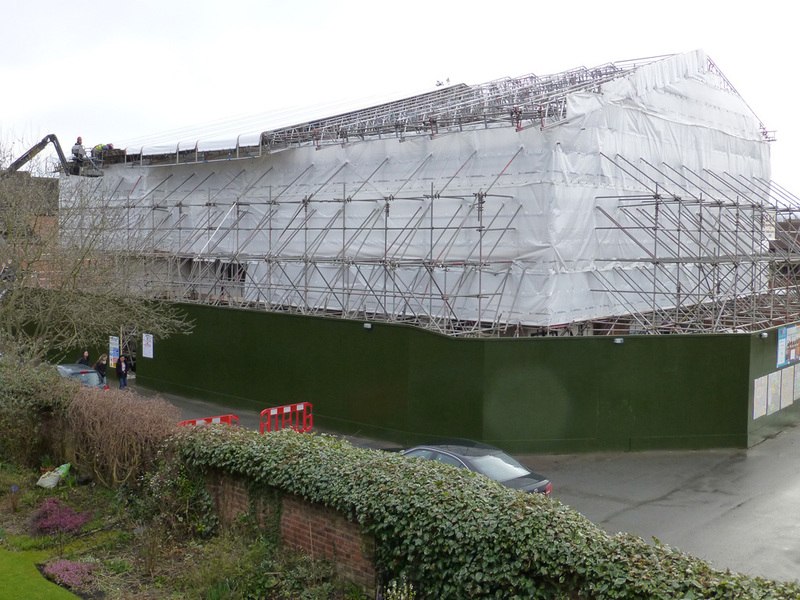 In 2010, The Master’s House was placed on the ‘Buildings at Risk’ Register and propped up with wooden buttresses. 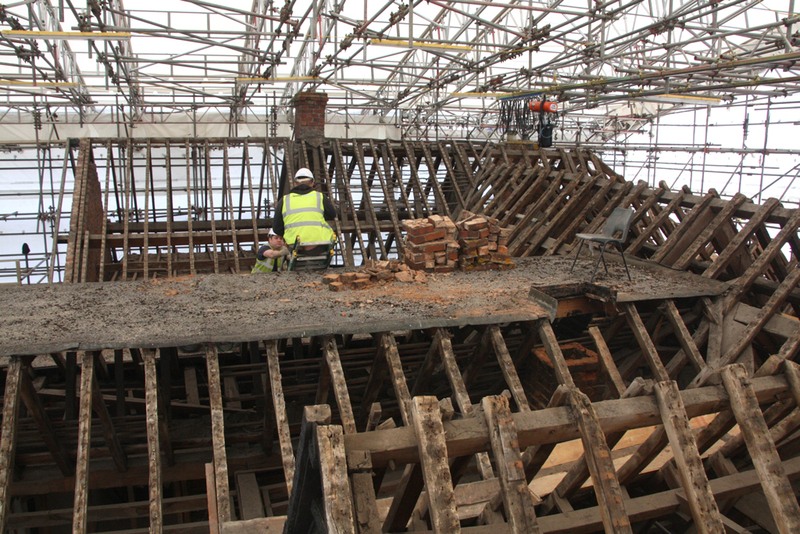 In 2011, principal contractor Speller Metcalfe started work on the Victorian wing, which was renovated and reopened in April 2012. In 2013, The Master’s House received Heritage Lottery funding for its restoration and redevelopment. The funding was to carry out a full conservation repair of the Grade II* listed building and preserve its heritage for future generations. 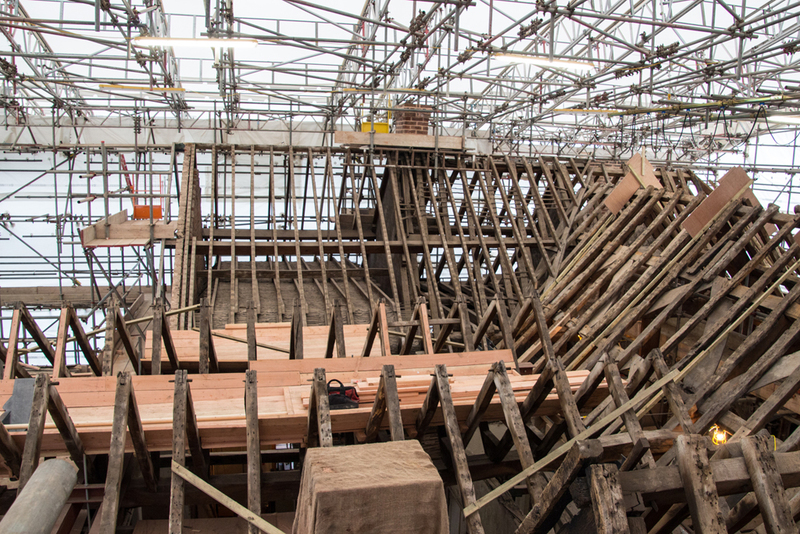 The work would make the medieval core of the building visible to the public for the first time in hundreds of years as well as serving as a fully accessible hub for statutory and voluntary sector organisations to serve the local community as well as a public library service. The principal contractor on the site was again Speller Metcalfe. The company appointed Ed Mandrell as the site manager and Conservation Architect Gary Butler as the lead architect. Their in-depth understanding of this medieval building proved invaluable in interpreting its history. At Gary’s request, several members of the Friends (Judy Conway, Robert Waddington, Pauline Fay and Pat Strauss) kept a photographic record of the project. 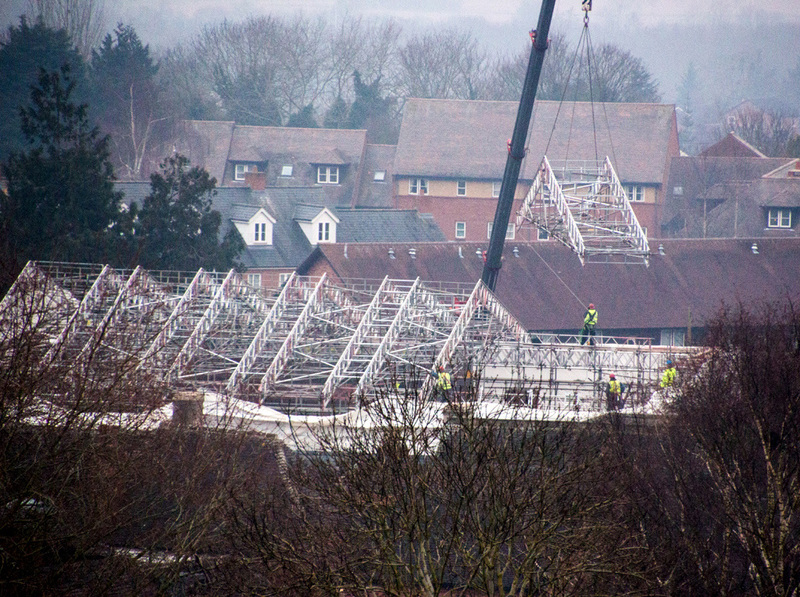 This involved taking a series of pictures from a number of precise viewpoints every two weeks, so that when the building work was completed there would be a series of views, rather like time-lapse photography, of the progress of the project. These photographs in sequence can now be viewed in the community resource area in The Master’s House. During the stripping out of the building there were a number of interesting findings. These include an old Hereford Times dated 1880 and advertising leaflets from 1950s and 60s. There was even a letter from the Sunday Times about advertising official appointments. As the frame was stripped back numerous different types of nail, some almost a foot long, several large keys and other ironmongery were found, even some broken clay pipes. All these items have been kept for display in the finished building. A selection of them can be seen in the drawers of the mobile unit, upon which is the model of The Master’s House. 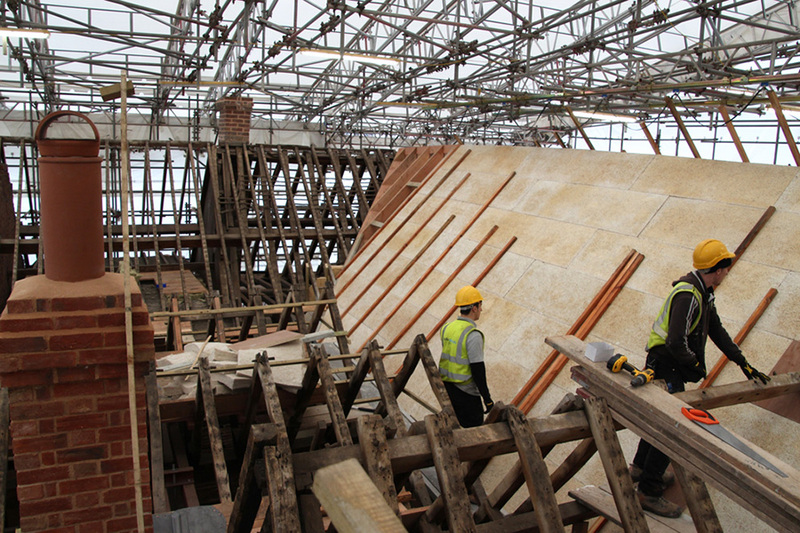 The timber frame, now stripped of all the old plaster and most infill panels, was cleaned, restored and repaired by many highly skilled craftsmen. The wattle and daub panels, which had been made with hazel in the earlier ones, and oak later, were saved and safely stored for later re-use and display. Some 15 – 20 samples of wallpaper were found on the walls and were conserved for further research at the Victoria and Albert Museum in London. The original timber-frame was built on stone foundations, of a better quality than those of the numerous later extensions, so some parts of the building were underpinned with concrete foundations, including the north side of the kitchen. Car-jacks were used to raise the kitchen’s timber-framing so that concrete foundations could be inserted beneath the sill beams. In the hall section of The Master’s House, it was found that the west end had sunk about eight inches (20cm) because the sill beam had slowly rotted away long ago, which explains why the closed medieval doorways, which were only revealed when the plaster was removed, appeared to be so short in height. This had happened so long ago that later building and extensions had taken this into account, so it was decided that it was safer to leave the building as it was, rather than try to raise it. 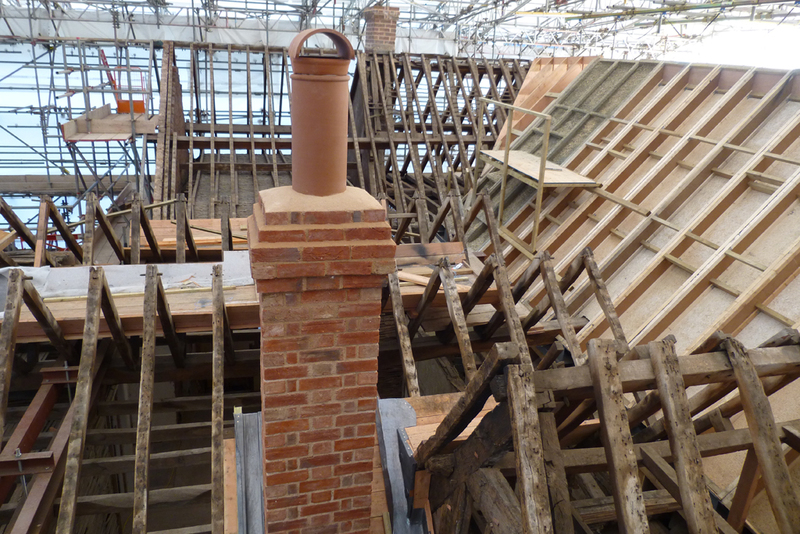 The hand-made roof tiles were carefully stored for re-use, but the Victorian machine-made ones were sold on to a reclamation firm. 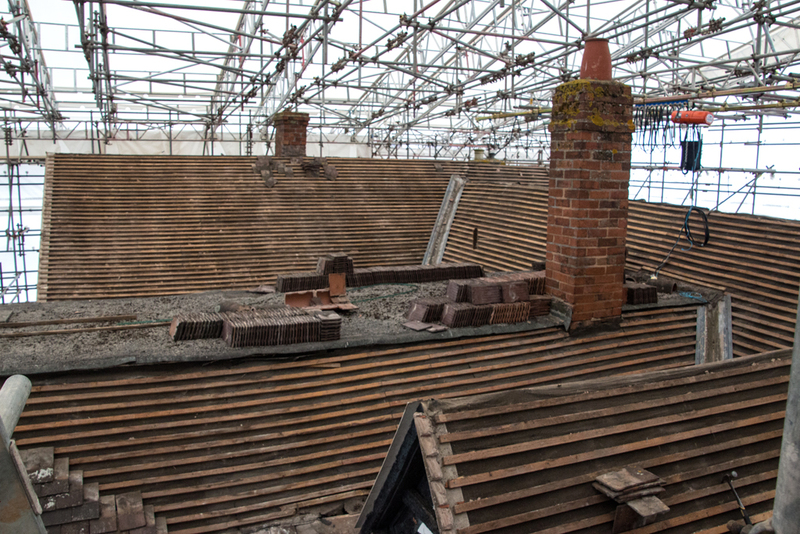 New hand-made tiles, plus those stored for re-use, were eventually replaced on the roof, using copper nails. Old window frames complete with their original ‘crown’ glass having also been carefully restored. The decorated beam, on which the biblical quotation was painted, was examined by paint conservation experts and suitably treated, during which time it was wrapped in special paper, then felt and placed in a special box, prior to its final restoration. Where the ends of other beams had been cut into the biblical quotation, by Edward Cowper’s workmen, when installing the gallery at this, west end, of the hall in Tudor times. These spaces have now been filled, so that the complete quote can be repainted and the beam then displayed in its original position, at the west end of the finished hall. It is hoped that analysis of the pigments used and research into the particular version of the bible the quotation comes from will enable an approximate date to be made of when the quotation was applied.